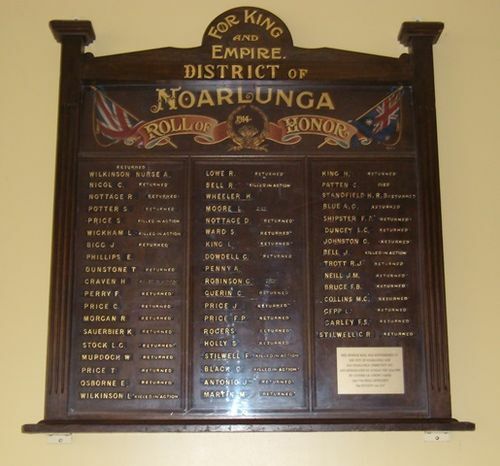 The District of Noarlunga Roll of Honour commemorates those who served in World War One. More "egg" arguments were in evidence at a conscription meeting held at Noarlunga on the night of October 16. The Attorney-General (Hon. J. H. Vaughan) has received a police report which states that at the meeting in question anti-conscriptionists turned out the lights and hurled eggs in the direction of the platform. When a kerosene lamp was secured to replace the lights it was found that the eggs had struck and bespattered a roll of honor, which had been unveiled earlier in the evening, and on which were inscribed the names of Noarlunga men at the front. "Is this how the anti-conscriptionists of the district honor the names of their brave countrymen?"' asked the Attorney General yesterday. Daily Herald (Adelaide), 24 October 1916.